Propane is the most widely used alternative fuel in the world. More versatile than natural gas, propane burns cleaner and more efficiently than fuel oils. Propane also costs less to use than electricity. However, like other fuels, propane is a combustible gas. Walk, don't run, to avoid creating static electricity. 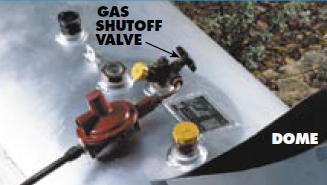 Shut off the gas supply using the shutoff valve on the tank or cylinder. Call Douglass Distributing using the closest phone outside the building. Stay outside the building until told to re-enter. Colds, allergies, congestion, and the use of tobacco, alcohol, or drugs may harm your sense of smell and make the smell harder to detect. Cooking odors or other strong odors can cover up the smell of gas. On rare occasions, propane gas may lose its distinctive odor - this is called odor fade. Air, water, and rust in a propane tank or cylinder may weaken the gas odor, especially if the valves were left open after the container was emptied or if it is a new container. Propane can lose its odor if a leak occurs underground. Odorant in leaking gas may adsorb (stick) to building materials such as unpainted or untreated masonry and rough wall surfaces, to furniture fabrics and drapes, and to the inside walls of gas piping and static or periodically used propane storage containers and distribution systems. Anyone who authorizes someone other than Douglass Distributing to perform maintenance, repair, remove, install, adjust, or service your propane system should notify us immediately of the work performed. Douglass Distributing does not authorize anyone to work on their system without having authorization in writing. We do this to keep you safe. If you ever have any questions regarding Propane Safety - feel free to contact Douglass Propane Customer Service and they will be happy to assist you.